After two decades of brilliant research on American poverty, Kathryn Edin noticed something she hadn’t seen since the mid-1990s — households surviving on virtually no income. 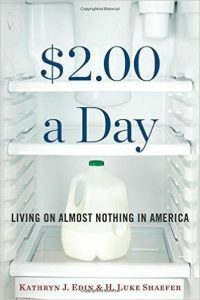 Edin teamed with Luke Shaefer, an expert on calculating incomes of the poor, to discover that the number of American families living on $2.00 per person, per day, has skyrocketed to 1.5 million American households, including about 3 million children. Where do these families live? How did they get so desperately poor? Edin has “turned sociology upside down” (Mother Jones) with her procurement of rich — and truthful — interviews. Through the book’s many compelling profiles, moving and startling answers emerge.